Lagos State Governor-elect Babajide Sanwo-Olu yesterday promised not to betray Lagosians when he assumes office on May 29. He pledged to run an all-inclusive government and fulfil other campaign promises he made to the people. The governor-elect spoke at the state office of the Independent National Electoral Commission (INEC), shortly after receiving his Certificate of Return from Resident Electoral Commissioner Sam Olumekun. Describing himself as a winner of a free, fair and credible election, Sanwo-Olu said the electoral commission deserved applause for conducting a peaceful exercise. He also extended a hand of fellowship to the 40 opposition candidates who competed with him, stressing that their input are required in tackling the myriad of challenges in education, health, transportation and the environment. “A victory for one is a victory for all. It is a victory for all Lagosisns. No victor, no vanquished. 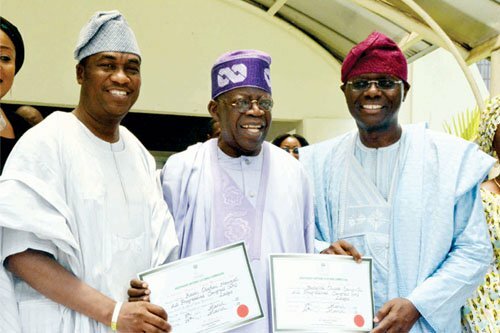 We will all make life better for Lagosians,” he said. Sanwo-Olu was accompanied by his wife, Dr Ibijoke; his deputy, Dr Obafemi Hamzat and wife, Oluremi; Lagos State APC Chairman Tunde Balogun; party secretary Dr. Wale Ahmed; Governorship Advisory Council (GAC) deputy leader Prince Oluyole Olusi; Senator Musiliu Obanikoro and Chief Demola Seriki. Also at the ceremony were Pastor Cornelius Ojelabi; Pa Sunny Ajose; Jumoke Okoya-Thomas; Hakeem Bamgbala; Joe Igbokwe; Abiodun Salami; Bayo Ajisebutu; Ayodele Adewale; Fausat Gbadebo; Emmanuel Bamgboye and Imam Shakiru Gafar Mofesayo of Lagos Central Mosque. Thanking the stakeholders, Sanwo-Olu commended INEC and other apparatus of government involved in the election, saying that the reward for hard work was more work. He also thanked President Muhammadu Buhari for showing leadership example. The governor-elect also applauded the National Chairman of APC, Comrade Adams Oshiomhole; Lagos APC GAC leaders, and Asiwaju Bola Tinubu, who he noted, was in birthday celebration mood. He prayed that all the critical stakeholders would be present at his inauguration on May 29. However, in an emotion-laden voice, Sanwo-Olu said the inauguration date would coincide with the post-humus birthday of his mother who had passed on a few years ago. Reiterating his commitment to an all-inclusive administration, the governor-elect said his doors were already open to stakeholders, including the opposition, to make their contributions to governance. He promised to re-enact the true greatness of Lagos which the stakeholders stand for. Sanwo-Olu added: “We will not betray public confidence. Better times are coming. Lagosians deserve the best. We must get it right in Lagos. If we get it right in Lagos, we will get it right in Nigeria. Imam Gafar, who paired with a Christian priest to pray for Sanwo-Olu and Hamzat, urged them to work for public good. The cleric, who also advised them to beware of sycophants who peddle falsehood, wished the governor-elect a successful tenure. Also, he charged Dr. Ibijoke Sanwo-Olu and Mrs Oluremi Hamzat to be prepared for the challenges of adjustment to new life and cooperate with their husbands. The REC reflected on the election, saying that it was adjudged credible, smooth, peaceful, free and fair by the international community.